Locating the ideal home boils down to finding a happy medium between the pros and cons, a comfortable middle ground between what you want and what you need. You'll find that this invariably will also be the case for the home that you decide upon. This being the case, in order for you to make an informed decision, make sure you have all your pros and cons lined up. In other words, before you engage your property agent of choice, do your due diligence, decide on your wants and needs in and around the house that you choose. After all, ideally, you'll want to relocate just the once, especially when you have a family in tow. To assist you in this rather challenging process we have given you a leg-up. We have prepared a list of all criteria that in our experience come up again and again. Consider all the items and then compile the ones that apply to you personally. This list will be your roadmap to your new home. Are you getting a company allowance or are you paying the rent out of your own pocket? Either way, give yourself a bit of margin, i.e. say your budget is S$5000, add a S$500 buffer above and below to play with. Also, keep in mind that rents vary depending on the type of accommodation, its geographic location, its TOP (temporary occupation permit) date, whether it's partially/fully furnished, its total floor size, proximity to MRT station, duration of the lease, etc. In other words, actually going to see the houses on your shortlist is a must. TIP: It's now a renters' market. Rentals have been on a slide lately, in part because of the recent recession, but also because of countless new apartments coming online this year and next year. So bargain quite aggressively and try to have a fall-back property so you don't accept your first choice landlord's offer to eagerly. Use the various maps in the menu to the right to orientate yourself. The visual nature of maps helps you get a better feel in which area of Singapore the various houses of your choice are located and where your needs and wants are in relation to it. Crucial here is the distance you need to travel between home and work. The same applies to your spouse and your kids' schools. TIP: Most international schools have comfortable school buses so there's no need to overly restrict your active radius here. An hour's travel time is quite doable in Singapore. My schoolbus used to take an hour, it was something all of us took in our stride. Once you have narrowed down your geographical area of your choice, you can continue down the selection process based on the number of rooms you need. Does each of the family members require a separate bedroom or are the kids young enough to share a room? Ask yourself this question, because you pay extra for each additional room. The following might be important enough for you to take into account. Gym, pool/jacuzzi, tennis/squash/basketball courts, spa/sauna, playground, BBQ pits, jogging track, concierge and security services, reading/function room, deli/supermarket. Perhaps these receive sufficient weight to influence your decision too. Banks, shopping centers, hospitals/clinics, public transport, airport, recreational park, beach, a garage for your car(s). Maybe a suitable (child-friendly) environment is something that features highly in your final decision. Do you prefer the serenity of a green belt (have a look at our nature parks overview map) or the downtown buzz? Or perhaps you wish to stay a few minutes' drive away from where your friends live. TIP: A simplified printer-friendly check-list is available here. Take a copy of this list with you when you go on a house hunt with your agent. To further narrow down your choices, you can eliminate the various types of houses that you are not interested in out of budget concerns or otherwise. The following home choices all have their own pros and cons. I think it's safe to say that most expats in Singapore opt for a private apartment as their abode, such as a condo or maisonette. The reasons for this are their generally favorable location, their luxurious character, their numerous typically upmarket amenities/facilities and their accessibility to other foreigners. 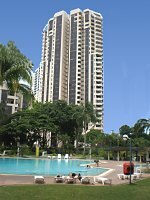 Arguably the largest of the condo units are the penthouses. They may comprise more than one floor and tend to boast, among other features, a rooftop garden, a private pool, a spa and - obviously - breath-taking views. However, note that the extensive roof surface area and large windows make for high electricity costs, because your air-con will be working overtime. TIP: Note that so-called "walk-up" apartments do not have a lift. Also note that the space outside your front door and the balcony both count towards your total unit surface area, so don't be surprised if the unit appears smaller than the registered surface area on the blueprint. Bungalows and colonial "black and white" mansions tend to be a fair amount costlier to rent than most regular condos, because they offer calm surroundings, come with their own patch of land/garden and there's no sharing any of the building structures with neighbors. Another type of landed property are semi-detached houses and terraced houses, such as the 19th century Peranakan shophouses that have been refurbished but still retain their old world cultural charm. A recent addition to the landed house variety are cluster homes, which share some facilities such as a garden or a pool with other landed houses. Unfortunately, most of these cluster homes tend to be so new that the odds of finding an unoccupied one are rather long. TIP: Landed property may be desirable for their garden and their tropical feel, but keep in mind that you could get ocassional interlopers in the form of roaches, spiders or snakes. So trim the grass short and clear vegetation mounds and rain drains regularly. These are essentially public flats that are mostly confined to New Townships developed in specific districts. Recently more and more expats have taken to HDB units, not only because the rules governing HDB rental to foreigners have been relaxed, but also because HDB living is quite affordable. Furthermore, HDBs tend to be located near public transport hubs, supermarkets and shopping malls. Lastly, the other reason I hear more often these days is that only by living in an HDB do you experience the true Singapore experience. Note: HDB units tend, at least in landlords' and agents' minds, to be ranked lower then apartments. And apartments are ranked lower than condos. Also, apartments are usually older but generally more spacious than condos, and are not associated with "facilities" (i.e. swimming pool, gym, bbq pit etc.). Condos however, do come with facilities. This is partly why condo rent on the whole is higher than apartment rent, which, in turn, is higher than HDB rent. Obviously, exceptions apply. TIP: Click here for an overview of Singapore's 28 districts. Ok, armed with the above information, it's time for you to take your first step. Click here to mail me what kind of accomodation it is you are looking for, your wish list to your dream home. I will get back to you with viewing suggestions within a day. Tip: Bookmark this site, because I'm sure the information you find here will come in very handy during your initial explorations here in Singapore and even long after you have settled down in your new life.